JFE Group TODAY |JFE Holdings, Inc. 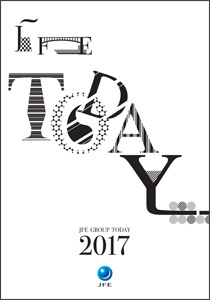 The JFE Group is delighted to present its all-new annual review, JFE Group TODAY 2017, an informative look at the Group’s past fiscal year in a reader-friendly format supported with abundant photos and graphics. We hope you enjoy the beautiful photo-essays, in-depth interview of the CEO, comprehensive overview of Group activities, and much more. available for free at the Adobe Web Site.